uniqueName – String. The hierarchy’s unique name. caption (optional) – String. The hierarchy’s caption. dimensionName (optional) – String. The dimension name. levelName (optional) – String. Used to specify the level of the hierarchy that is shown on the grid or on the chart. sort (optional) – String. The sorting type for members ("asc", "desc" or "unsorted"). sortOrder (optional) – Array of strings. Set custom ordering for hierarchy members. Only for "ocsv", "csv", and "json" data source types. sortOrder can be specified like this: ["member_1", "member_2", etc.]. drills (optional) – Object. Contains drill-down information in multi-level hierarchies. drillAll (optional) – Boolean. Indicates whether all levels of all hierarchies in the slice will be drilled down (true) or drilled up (false). columns (optional) – Array of objects. Used to save and restore drilled down columns. rows (optional) – Array of objects. Used to save and restore drilled down rows. drillThrough (optional) – Array of strings. Allows pre-defining the slice for the drill-through view. Only for "ocsv", "csv", and "json" data source types. drillThrough can be specified like this: ["Hierarchy name 1", "Hierarchy name 2", etc.] (see live demo). expands (optional) – Object. Stores information about the expansion of nodes. expandAll (optional) – Boolean. Indicates whether all nodes in the data tree will be expanded (true) or collapsed (false) on the grid and on the charts. columns (optional) – Array of objects. Used to save and restore expanded columns. rows (optional) – Array of objects. Used to save and restore expanded rows. uniqueName – String. The measure’s unique name. aggregation (optional) — String. The name of the aggregation that will be applied to the measure ("sum", "count", "distinctcount", "average", "median", "product", "min", "max", "percent", "percentofcolumn", "percentofrow", "index", "difference", "%difference", "runningtotals", "stdevp", "stdevs"). If the measure is calculated, aggregation will be set to "none". availableAggregations (optional) — Array of strings. Represents the list of aggregation functions that can be applied to the current measure. If the measure is calculated, availableAggregations will be set to . formula (optional) – String. Represents the formula. Refers to the calculated measure. It can contain the following operators: +, -, *, /. Other measures can be referenced using the measure’s unique name and the associated aggregation function, for example sum("Price") or max("Order"). Flexmonster Pivot supports the following aggregation functions for CSV, OCSV, and JSON data sources: "sum", "count", "distinctcount", "average", "median", "product", "min", "max", "percent", "percentofcolumn", "percentofrow", "index", "difference", "%difference", "runningtotals", "stdevp", "stdevs". individual (optional) – Boolean. Refers to the calculated measure. Defines whether the formula is calculated using raw values (true) or using aggregated values (false). Default value: false. calculateNaN (optional) – Boolean. Refers to the calculated measure. Defines whether the formula is calculated using NaN values (true) or using null values (false). Default value: true. levelName – String. The hierarchy’s unique name. properties – Array of strings. Represents the properties to be shown on the grid. Other available member properties can be accessed through the context menu. caption (optional) – String. The hierarchy caption. tuple – Array of strings. Consists of unique names that identify the column in the table based on the column’s data. aggregation (optional) – String. The measure’s aggregation type. type – String. The sorting type ("asc" or "desc"). tuple – Array of strings. Consists of unique names that identify the row in the table based on the row’s data. See the same example with a default slice on JSFiddle. See the same example on JSFiddle. See an example with a report filter on JSFiddle. 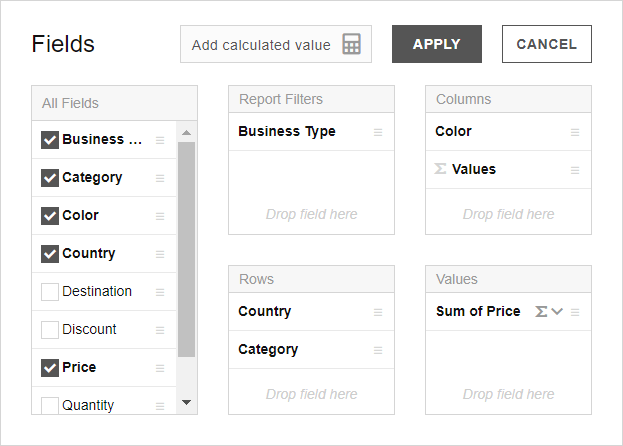 Use the Field List to define report filters, rows, columns, and values at run time. Sorting, filtering, drill-ups, drill-downs, and expand/collapse operations are available directly on the grid and on built-in pivot charts. You can change the slice along with other report parts using the API call setReport(). To change only the slice use the runQuery() call.